Kyle Zimmer is 0-1 with a 9.00 ERA after his first three big-league games. Kyle Zimmer‘s long journey from first-round draft pick to the major leagues has hit a speed bump. 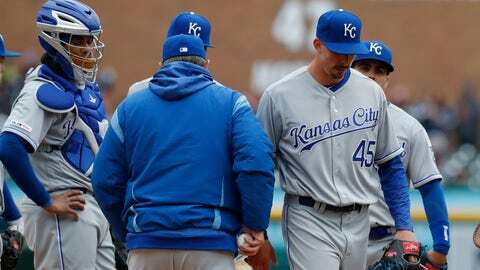 Zimmer, who made the Kansas City Royals‘ Opening Day roster out of spring training, was optioned to Triple-A Omaha, the team announced Monday. Replacing him is right-hander Glenn Sparkman. Zimmer was a first-round draft pick by the Royals in 2012. His path to the major leagues was beset with injuries, but he finally got past them and was named to the 25-man roster for the 2019 season. He made three appearances, including a scoreless inning with two strikeouts in his major league debut March 31. But he walked the bases full and took the loss against Detroit in his next appearance, and he allowed two walks and a hit in a scoreless inning Saturday. Sparkman was 0-3 with a 4.46 ERA in 15 games (three starts) for Kansas City last season.